Knowing who the Garde Manger, Sous and Chef de Cuisine are will quickly become part of your daily routine (if it’s not already), even if your position within the restaurant doesn’t have you on the line. All professional kitchens at restaurants and hotels use The Kitchen Brigade System (i.e., Brigade de cuisine) which was developed by Georges Auguste Escoffier. This structure was created to optimize team efficiency in the kitchen. Depending on the size and style of your restaurant, its complexity and the responsibilities, names used within the kitchen brigade will vary slightly. Restaurant groups with several properties will often have a Chef whose job is to oversee the cuisine and operation of all restaurants within the group. Danny Meyer, Daniel Boulud, David Chang and Jean Georges are all great examples. The kitchen leader who oversees the menu, preparation, cooking, ordering, and the operations of the restaurant. French for "under-chef of the kitchen" is the second in command in a kitchen and holds much responsibility of the daily operations in the kitchen. The responsibilities of the Chef de Partie positions vary depending on the size of the restaurant.. These positions are the gears that drive the professional restaurant machine. Usually found wearing checkered pants, the responsibilities of a line cook include stocking stations with necessary supplies and cooking menu items. Line cooks typically answer, report and follow instructions of the Executive Chef and/or Sous Chef. 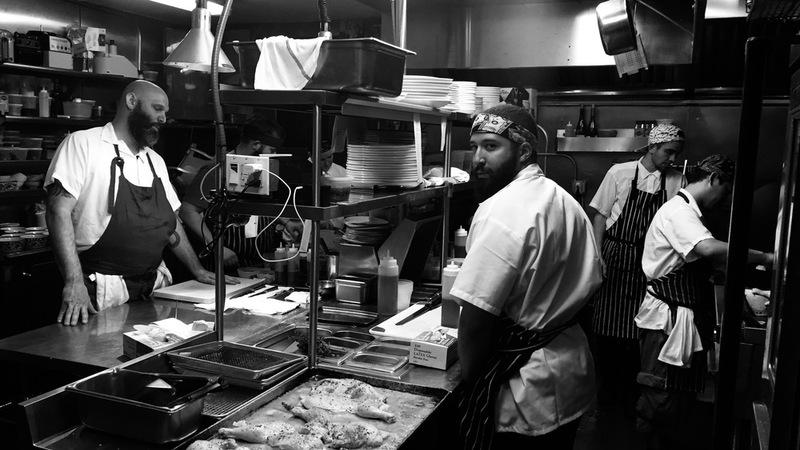 Usually a junior member of staff who works under a chef de partie to learn the ins and outs of a specific station. A prep cook often works behind the scenes chopping vegetables, butchering meat, and preparing ingredients that allow the cooks to actually cook. This position is also responsible for the cleanliness of the kitchen and prep areas. One of the toughest jobs in the kitchen, this position ensures the the availability of clean dishes, glasses, flatware, pots, and pans - vital for both the kitchen and service teams as well as every guests’ experience. This position often handles a variety of tasks to keep businesses running cleanly and smoothly, ensuring that the facilities are neat, clean, free from clutter. The lead chef operations who oversees dining for large amounts of people (e.g., parties, galas, events, offsite locations, and banquet halls). See Chef de Cuisine. A line cook who works exclusively for large format banquet and catering operations. Assistant chef for large format banquet and catering operations.See Banquet Chef and Sous Chef. The kitchen role in charge of preparing meats and poultry before they are delivered to their retrospective stations, the butcher chef may also handle fish and seafood preparations. Butchers also receive, inspect, store, cut, bone, grind, weigh, wrap, and display pieces of meat. A line cook who prepares vegetables, soups, starches, and eggs. Larger establishments may employ multiple chefs to work this station. A potager would be in charge of making soups, and a legumier would be in charge of preparing any vegetable dishes. See Line Cook, Potager. A line cook at a fast casual restaurant that does not offer full table service, while still specializing in higher quality food than fast food establishments, with fewer frozen or processed ingredients. See Line Cook. A line cook specializing in the preparation of fried food items. See Line Cook. This role is responsible for the preparation of cold dishes, such as salads and pâtés. As the name implies, this type of line cook focuses on all foods that require grilling. See Line Cook. Japaneses for "in front of the board", this chef specializes in Japanese cuisine.See Chef de Cuisine. A line cook with similar responsibilities to a sous chef. See Sous Chef. A line cook who mixes ingredients according to recipes to make breads, pastries, and other baked goods. Confectionery wizards have the sweetest job in the kitchen and are in charge of the desserts and baking menu items. See Sous Chef. A line cook who specializes in you guessed it - pizza. See Line Cook. A line cook who is an expert in the preparation of fish dishes, and often responsible for fish butchering as well as creating the appropriate sauces. See Line Cook. A line cook in charge of making soups and stocks.See Line Cook. The lead chef for a private residence of VIP clientele (e.g., celebrities, royalty) which could range anywhere from a penthouse apartment to a yacht in an exotic location.See Chef de Cuisine. A line cook responsible for the preparation of roasted meats and the appropriate sauces. See Line Cook. A member of the kitchen team who fills in as needed on all of the stations, rather than having a specific job. Often the most respected role in the brigade system of stations, reporting directly to the head chef or sous-chef. While responsible for sautéing foods, the most vital role lies within the creation of the sauces and gravies that accompany other dishes. A line cook who knows the difference between a “cowboy with spurs” and “sinkers with suds” - typically found at diners and cafes that serve simple and delicious food, fast (e.g., Western omelette with fries; doughnuts and coffee). See Line Cook. Japanese for "near the cutting board." The wakiita's duties expand to include daily preparation of the fresh ingredients. See Sous Chef.